Although evidence indicates that MA does not directly increase the release of glutamate in the stria-tum (25), several studies suggest that activation of the corticostriatal pathway following MA administration may be responsible for increased striatal extracellular glutamate concentrations. The increases in striatal extracellular glutamate that are typically observed after MA are tetrodotoxin (TTX) sensitive (Fig. 1), suggesting that MA-induced changes in glutamate are impulse mediated. Moreover, unilateral ablation of motor and premotor cortexes decreases striatal glutamate acitivity by eliminating a majority of corticostriatal efferents (38) and protects against MA-induced damage to DA terminals (Fig. 2). In addition, MA treatment increases extracellular concentrations of glutamate and decreases glutamate immunolabeling of nerve terminals in both the motor cortex and striatum, suggesting that a release of neuronal glutamate occurs in both these regions (36,39,40). Fig. 1. 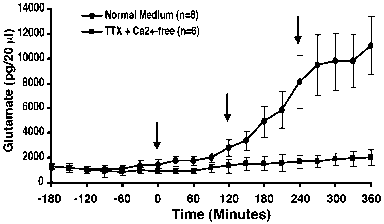 Intrastriatal perfusion with TTX+ and Ca2+-free medium blocks the increase in extracellular glutamate levels following repeated administration of MA (arrows indicate injection of 7.5 mg/kg MA at times 0, 120, and 240 min). Bar indicates time of perfusion. Fig. 2. Unilateral cortical ablation prevents the loss of striatal DA content 1 wk following MA administration (10 mg/kg x 4 doses over 8 h). Removal of cortical inputs to the striatum did not alter DA tissue content. *p<0.05 verses other groups. 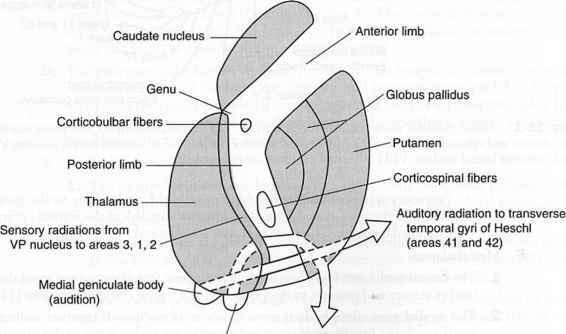 these cortical regions (43). MA also produces silver staining and reactive gliosis in these striatal and cortical regions, suggestive of a correlation between glutamate release and lasting neuronal damage (6,44,45). In addition, MA alters binding to NMDA receptors specifically within the striatum and somatosensory cortex (46) and degenerates cell bodies in this cortical region (47,48). Together, these data indicate that MA increases glutamatergic activity, specifically within the corticostriatal pathway, that, in turn, may produce damage to dopaminergic striatal nerve terminals and nonmonoaminergic cortical cell bodies.